Coming Soon! 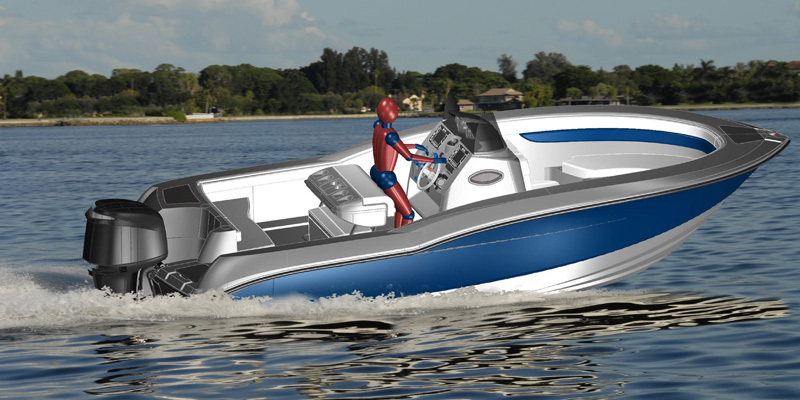 : One part sport boat, and one part utility boat, the new Barracuda 238 Center Console Fish Boat is 100% excitement on the water. The combination of unmatched performance and innovative utility creates one of the most unique Sport Fishing Boats on the market. The Patented SureTrac™ 22’ Deadrise Performance Hull Features a full length keel pad, to deliver brisk top speeds, without “hunting” for the pad. The Vented Chine, with Patented SureTrac™ Turning Fins, assures you that you will carve the water at will. Sound suppression carefully negates standing waves created in the step area of the hull, and Patented StraightTrac™ Vortex Generators assure you that Bow Steer while trolling will be virtually eliminated. And the boat is equally as impressive above the waterline. The immense bow flare allows you to take on wakes that would have most 26 footers reeling in agony. And you will do plenty of reeling in the big fish, with molded in fish boxes in the bow, floor, and transom. An immense livewell is positioned dead center of the boat, and innovations such as a convertible prep station will ensure that no fish gets away. Boasting other innovative features such as a fully enclosed Head Compartment, with sink, shower, and stand-up changing room, the 238 CCF never ceases to amaze.